GCC: Setting up precise analog stick positions? I've been trying to find a way to reliably set the stick's position to a specific coordinate on the "input grid" (might not the correct term for it, unsure) for TAS applications. The closest thing that I've been able to get to that is by lowering the stick radius and using the keyboard to move the stick in a cardinal direction, but this method limits my inputs to the X and Y axis of the "grid." Pressing two directions allows me to make an input on a diagonal axis (along the "Y = X" line, for example), but so far I have not been able to find a way to get the stick's position to anywhere in between these 8 directions. What I mean by "input grid" is the analog directions shown in GameCube's controller configuration. Imagine the stick positions as a part of a mathematical graph separated into the 4 different quadrants. When the stick is in the default, untouched position, it sits right at [X = 0, Y = 0]. Moving the stick to the right moves the position along the X axis, and if the stick radius is set to 100 and it's being fully pushed in that direction, then the coordinates become [X = +100, Y = 0]. Moving the stick all the way to left would be [X = -100, Y = 0], up would be [X = 0, Y = +100], and down would be [X = 0, Y = -100]. Diagonal up+right would be [X = +100, Y = +100], diagonal down+right would be [X = +100, Y = -100], etc. 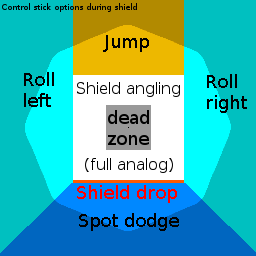 Setting the stick radius to 50 would create inputs such as [X = 0, Y = 50] for up and [X = -50, Y = +50] for up+left. Now that I've explained that, I was wondering if there's some method of getting the stick to precise locations of the grid. Examples would be [X = 80, Y = -54] and other such locations of the grid that are very specific and otherwise unobtainable via keyboard only. I'm aware that I can use a regular controller and move the stick to that position myself, but I can only estimate the stick's position when I do this and my hands can only stay still for so long. Any ideas? I'm currently using Dolphin 4.0-7840, so if a feature similar to what I'm outlining already exists or has existed in a previous version of Dolphin then let me know with a comment. Thanks! Isn't this the whole point of the TAS menu? I may be mistaken, but it sounds like that's what you want to use. (10-31-2015, 12:20 PM)AnyOldName3 Wrote: Isn't this the whole point of the TAS menu? I may be mistaken, but it sounds like that's what you want to use. Didn't even know that the TAS Input menu was a thing until just now. It looks like I'll be able to use this for sure, thanks for the reply.